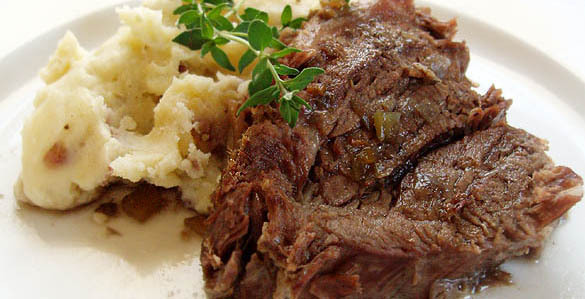 No Kidding: Pot Roast! | Delicious! Delicious! Mr. R. sits at the table with a thick book open before him. He is dressed in his usual Hollywood attire again and looking much refreshed. Caryn brings in the sliced roast on a large serving platter and a bowl of hot, buttery smashed potatoes. Mr. R. looks up from his book and examines his dinner. Is this what I’ve been smelling all day? Yes, sir. It cooked for almost four hours. Makes it soft. Well, I’m finally hungry again. Looks great. He spears a couple pieces of beef with his fork and drags them to his plate. Caryn pushes a bowl of sauce closer to him and he spoons it over the meat. Well, Caryn, are you ready to cook out of a trailer? I’ve been packed for days! MR. R. piles potatoes next to his entree. Great, then you can help me pack. Caryn backs up to the door. I think I better leave the packing to you and Flora. I’ve seen your shoe collection. Mr. R. laughs as the beef seemingly melts in his mouth. That’s funny, but I really wasn’t kidding. Caryn slumps in the door. I know. I’ll get the suitcases out. After reading the fabulous article about pot roasts in Cook’s Illustrated, I couldn’t wait to try my hand at it again! The meat is fall-apart tender and incredibly tasty. Slice leftovers for hot, open-faced sandwiches the next day. 1. Preheat oven to 300 degrees. Season roast with salt and pepper. 2. Heat oil in large Dutch oven. Brown roast until golden on all sides, about 10 minutes. Remove from pan and set aside. Add onion, carrot and celery. Cook over medium heat until starting to brown, about 6 minutes. Add garlic and sugar and cook for 30 seconds. Add chicken and beef broth and thyme. Return roast to pan and add enough water until liquid is half-way up the sides of the roast. Bring to a simmer. 3. Cover with a layer of foil and then the lid (foil makes seal tighter). Transfer pot to oven. Turn roast every 30 minutes and cook until very tender, about 3 1/2 hours. 4. Add potatoes to Dutch oven and continue to cook until potatoes are tender, about 20 minutes. Remove potatoes from pan and set aside. Transfer roast to carving board and cover with foil. 5. When liquid is slightly cool, ladle into a large, heavy-duty plastic bag. Allow fat to rise to surface. Snip off corner of bag and drain liquid back into pot, stopping before fat layer is reached. Boil over high heat until reduced by half, about 8 minutes. Add red wine and boil 2 minutes longer. Season with salt and pepper. 6. To make potatoes: Smash potatoes with fork or potato masher. Add butter and cream and stir with a spoon. Season with salt and pepper and garnish with a pad of butter. 7. Meat can either be sliced or pulled into large pieces. Spoon sauce over meat. Serve with potatoes and remaining sauce on side. Garnish with thyme sprig, if desired. i dont even eat meat very often and that looks DAMN good, printed it out and will be making it this weekend! I just read your whole site, and I really enjoy it! I was drawn here by the recipes/photos but now I’m totally hooked on this story of yours! But seriously, be careful with Lauren. The more R likes you, the more threatened she will feel and the more she will try to undermine you. Good luck with the packing Caryn. Juliette, did you make it? Did you like it? I think it’s a good, basic recipe that turns out well. And then it leaves tons of room for adaptation to particular tastes! AK, thanks for the warnings! Glad you took the time to read it! Tea, the roast is really tender. I kept picking at it!